Dr. Andrew Harms holds a Doctor of Musical Arts degree from the University of Cincinnati College-Conservatory of Music with a concentration in German Studies, a Master of Music degree from the University of Missouri-Kansas City Conservatory of Music and Dance, and a Bachelor of Music degree with a minor in English Literature and Composition from Missouri State University. Andrew also completed performances studies at the University of Miami. Andrew is equally comfortable as a performer, teacher, and researcher. He has been recognized as a finalist by a multitude of national and international conferences, competitions, and organizations, including the International Trumpet Guild, National Trumpet Competition, the Music Teachers National Association Chamber Music Competition, the Naftzger Young Artist Competition, the Minnesota Orchestra Young Artist Competition, and the U.S. Fulbright Student Program. As a soloist, Andrew is often featured in traditional instrumental mediums, as well as both historic and contemporary performance. Andrew has been involved in the commissioning and premieres of over a dozen new works, including Contraptions by John Cheetham, Zelik by Annika Socolofsky, and Anticitizen One by Paul Poston, and has performed with several of Boston’s top new music ensembles, including Sound Icon and the New England Philharmonic. Andrew also holds the position of Solo Cornet with the New England Brass Band, also serving on the Board of Directors. As a teacher, Andrew is one of the most highly sought on the East Coast, maintaining a busy studio of students on all brass instruments based in Boston, MA. Andrew also serves as faculty and brass chamber music coordinator at New England Music Camp in Sidney, ME. Andrew has also served on faculty and as Assistant Department Head of Music at Appel Farm Fine Arts Center near Philadelphia, PA, where he also founded the program’s first full symphony orchestra. Pior do these appointments, Andrew maintained an active studio in the Austin, TX area. Andrew’s students have participated in many of New England’s top honor bands and orchestras, and have participated in prestigious study programs such as the Boston Youth Symphony and Tanglewood. Many have gone on to study at many of the nation’s top music schools and conservatories, including Boston University, New England Conservatory, University of Texas, and Oberlin Conservatory. As a researcher, Andrew’s primary field is film music, particularly that of German composers in the 1930’s and 1940’s as they related to the Nazi propaganda program. 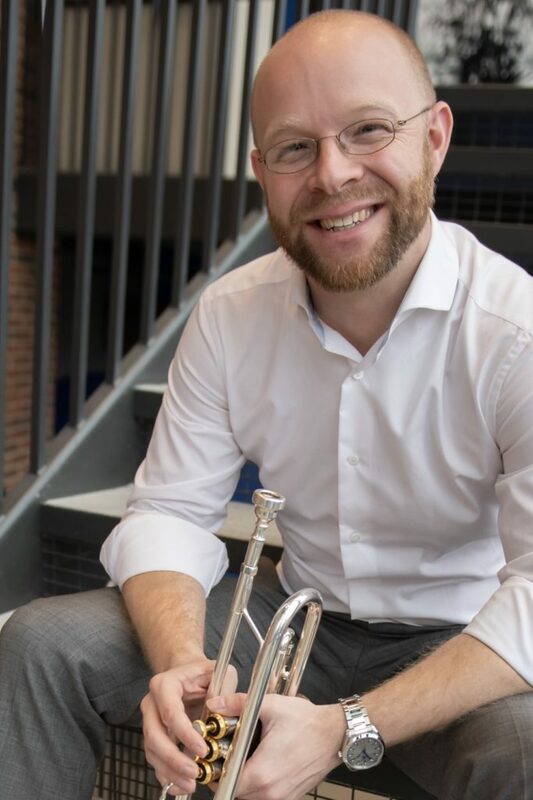 Andrew has presented extensively on the trumpet’s role in Leni Riefenstahl’s films and their influence on the trumpet music of the period, such as Paul Hindemith and Karl Pilß. Andrew has taught seminars on film music at New England Music Camp and in Boston, MA. Additionally, Andrew has conducted research on the veracity of Torelli’s famous concerto and has performed many of the composer’s works with string ensemble.